The textile mills of Lowell, Massachusetts, the cradle of the American Industrial Revolution, employed 8,000 workers by the 1840s, ninety percent of whom were women. These "mill girls" arrived in Lowell from farms all over New England and lived in company boardinghouses, worked long days, and pursued cultural and literary interests in their off hours. 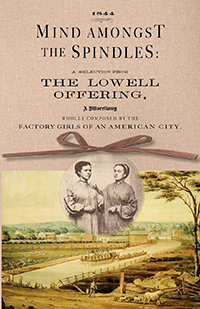 From 1840-1845, the mill girls wrote, edited, and published their own literary magazine, "The Lowell Offering." In 1844, "Mind Amongst the Spindles" was published as a selection of pieces from "The Lowell Offering."